Qatar Airways is pursuing rapid expansion in the Singapore market as Singapore Changi becomes only the third airport in the world with A350 service. Qatar introduced A350 service on Doha-Singapore on 11-May-2015 and will be deploying three of its initial fleet of five A350s on the route by Aug-2015. Qatar is also introducing a third daily flight to Singapore. The combination of the new third daily frequency and up-gauging the existing two flights from 787-8s to A350-900s will result in a 67% increase in seat capacity for Qatar in the highly competitive Singapore market. Premium seat capacity will increase by 145% as Qatar seeks to raise its share of the Singapore corporate market. The additional capacity will enable Qatar to continue increasing its share of the Singapore-Europe market but also become a significant player in the Singapore-North America market as the new third daily flight improves connection times from North America. Qatar Airways began operating the A350-900 XWB to Singapore on 11-May-2015. Doha-Singapore is only the second route for the A350, which Qatar has been operating on Doha-Frankfurt since the end of 2014. Qatar has been using the A350 on both its Doha-Frankfurt flights since Mar-2015, when it took its second of 80 aircraft. Qatar took delivery of its third A350 in early May-2015, enabling the carrier to begin deploying the aircraft to Singapore earlier than initially planned. Qatar first announced at the beginning of Feb-2015 plans to deploy the A350 on the Singapore route from 16-Jun-2015. At the same time Qatar announced the launch of a third daily flight to Singapore from 1-Jun-2015. Qatar is still planning to add the third daily flight to Singapore from 1-Jun-2015. This flight, which provides a new morning departure from Singapore, will be briefly be operated with 787-8 aircraft. Qatar aims to be operating all three of its Singapore flights with A350s by early Aug-2015. It could potentially complete the transition in Jul-2015 if Qatar ends up taking its fourth and fifth A350 early, a feasible scenario given that the third aircraft was delivered earlier than planned. Doha-Frankfurt and Doha-Singapore will be the only two routes in the world that are operated with the A350 until Jul-2015, when Vietnam Airlines plans to place its first A350 into service. Vietnam Airlines is slated to take its first of 14 A350s in late Jun-2015 or early Jul-2015. It plans to use the A350 initially on regional routes before beginning long-haul services on 30-Sep-2015, when Vietnam Airlines intends to use the A350 on its six times weekly Hanoi-Paris service. Vietnam Airlines also plans to use the A350 on its three times weekly Ho Chi Minh-Paris service by the end of Oct-2015. Finnair’s Helsinki-Singapore route is slated to transition to the A350 in May-2016, at which point Singapore will already have at least two and potentially three A350 operators. Singapore Airlines and Cathay Pacific are both slated to take their first A350s in 1Q2016. Two other Asian carriers, China Airlines and Thai Airways, are also slated to begin taking A350s by the end of 2016. The Doha-Singapore route will see the biggest concentration of A350 capacity for at least one year. Qatar will have 5,943 weekly one-way seats in the Singapore market when its third flight transitions to the 283-seat A350. This represents a 67% increase compared to the 3,556 weekly one way seats Qatar provided in the Singapore market the week commencing 4-May-2015, when it operated two daily flights with 254-seat 787-8s. Qatar is increasing economy seat capacity in the Singapore market by 60% while business class capacity is increasing by a staggering 145%. Qatar’s decision to dedicate its initial batch of five A350s to Frankfurt and Singapore is in response to high demand for the premium services in these markets. Qatar has particularly discovered the 22-seat business class cabin in its 787-8s is too small for the Singapore market. Qatar served Singapore with 777s configured with 42 business class seats before transitioning both of its Doha-Singapore flights to the 787-8 in 2014. By now transitioning to the A350-900, Qatar gains back 14 of the 20 business class seats on the two pre-existing flights as the A350 has a significantly larger concentration of premium seats compared to the 787. Qatar also gains 36 business class seats per day from Singapore due to the launch of the third frequency. While Qatar in theory cut capacity on Doha-Singapore in 2014 as it transitioned from 777s to smaller 787s at about the same time it stopped continuing some of its Singapore flights to Bali. As a result capacity for the local Singapore market increased in 2014, particularly in the economy cabin. Qatar transitioned one of its Singapore flights from 777s to 787s at the end of Mar-2014 while its second flight was transitioned from 777s to 787s in Aug-2014. Qatar launched Doha-Bali non-stop flights in Jul-2014. Bali, which is not served by any other Gulf carriers, has been an extremely successful market for Qatar, prompting it to add a second daily non-stop flight on the Doha-Bali route from 16-Jul-2015. Decoupling Bali with Singapore enabled Qatar to expand in the local Singapore market and in particular pursue a larger share of traffic to Europe. Data from OAG shows that Qatar Airways carried over 7% of passengers between Singapore and Europe in the Dec-2014 to Feb-2015 period. In the Dec-2013 to Feb-2014 period Qatar’s share of this market was less than 4%. Emirates has seen a similar spike in market share between Singapore and Europe, driven by the Aug-2014 launch of its fourth daily non-stop flight on the Dubai-Singapore route. Meanwhile SIA’s share of the Singapore-Middle East market slipped significantly as competition against Gulf carriers intensified. The 68% increase in capacity Qatar is implementing over the next three months in Singapore should enable it to carry even more passengers in the Singapore-Europe market. Europe is already by far Qatar’s largest market from Singapore. The Middle East is a much smaller and highly seasonal market from Singapore. Africa is also a very small market from Singapore. The new third daily flight also improves Qatar’s position in the Singapore-Europe market as the new morning departure from Singapore opens up seven new city pairs, mainly secondary destinations in Europe which were previously did not connect with any of the Singapore flights. The new morning departure from Singapore also opens up new daytime connections to several major European destinations which previously only were served from Singapore with overnight connections (including London, Milan and Rome). Meanwhile, the third flight from Doha significantly improves connection times from North America to Singapore. As flights from seven of Qatar’s eight North American gateways arrive in Doha between 5pm and 6pm, a layover of eight to nine hours is currently required for passengers heading to Singapore as currently the flights from Doha to Singapore only depart at 2:25am and 7:00am. Qatar has been competing in the Singapore-North America market for several years and offering relatively quick connections on the westbound sector. But offering long transit time on the eastbound sector from seven of its North American gateways has made it very difficult to secure a significant share of the Singapore-North America market, particularly in the corporate segment. Offering a more competitive product between Singapore and North America is particularly important as Qatar is focusing on further expanding its US network. Qatar announced plans on 4-May-2015 to launch services in 2016 to Atlanta, Boston and Los Angeles. The three new US routes, which will be launched between Jan-2016 and Jul-2016, will give Qatar 10 gateways in the US and 11 gateways in North America when also including Montreal in Canada, where it is unable to pursue network expansion due to the bilateral constraints. Philadelphia, Dallas and Miami were all launched in 2014. Singapore-New York is a relatively large but extremely competitive market with over 15 European, Gulf, North Asian and US carriers offering similar total transit times to Singapore Airlines, which serves New York daily via Frankfurt. Competition in the corporate sector of this market intensified significantly in late 2013 after SIA dropped its non-stop all-business class flights between Singapore and Newark. Several Asian, European and Gulf carriers also compete aggressively on schedule and price between Singapore and other US east coast gateways. The Singapore-US west coast market is slightly less competitive as routings via the Gulf or Europe are circuitous although a larger number of North Asian carriers serve the west coast. 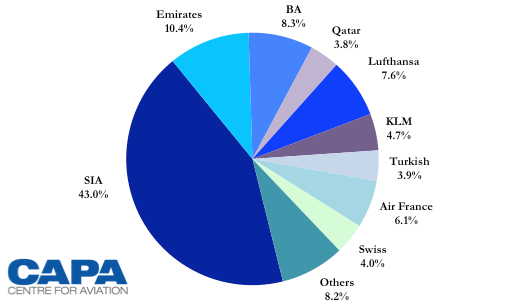 The Gulf carriers often provide the most competitive fares in the Singapore-east coast US market. For example, Etihad and Emirates are both currently offering return all inclusive fares between Singapore and New York for about SGD1400 (USD1050). Qatar is currently more expensive, with fares starting at about SGD1900 (USD1420) but often runs similar promotions to its Gulf rivals from Singapore. For example, Qatar was offering all inclusive return fares from Singapore to several European destinations from SGD888 (USD665) in Mar-2015 as part of a campaign initiated after it began selling the third daily flight. The additional capacity will make Qatar the fourth largest non-Asian carrier in the Singapore market after Emirates, Qantas and British Airways. 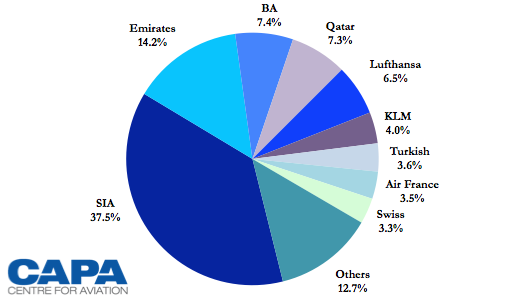 With just the two 787 frequencies Qatar was also behind Lufthansa, United, Air France and KLM. Qatar may also need to relook at its Singapore strategy. Qatar is relying entirely on the local market and for now has no interest in following rival Emirates in leveraging Singapore as a hub. Emirates sees a growing portion of its Singapore traffic connect to flights operated by partners Qantas and Jetstar Asia. Qatar should start to look at building connections in Singapore to Australia, where it has a relatively weak presence, and secondary destinations in Southeast Asia. BA could emerge as a partner and provide connections to Sydney, which Qatar does not yet serve with its own metal, as working with another fellow oneworld member, Qantas, may not be palpable given its tie-up with Emirates. Singapore-based LCCs could provide an intriguing option for regional connections, potentially Jetstar Asia. Qatar is banking heavily in Singapore as it allocates three of its new state of the art A350s to the Singapore market. Absorbing the additional capacity could present some challenges, particularly if Qatar continues to rely entirely on the local market. There are opportunities to gain market share from Singapore to Europe and North America but these are highly competitive and generally low-yielding markets. Operating three A350 flights in SIA's home market six months before SIA has had a chance to deploy its first A350 provides a big statement and raises the stakes in Singapore. The battle has just begun.